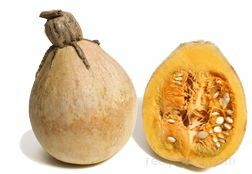 A type of winter squash that resembles an acorn in shape and typically measures from 6 to 10 inches in length. Acorn squash may be dark green, tan, white, or gold colored. The most common variety is the Green Acorn with a dark green ridged outer skin and a deep yellow to orange flesh. The Golden Acorn has a pumpkin orange colored outer skin with the traditional orange inner flesh. Both the Green and Golden are smaller sized Acorn squash. A more oval or longer shaped type of Acorn Squash is known as the Fordhook Acorn Squash. This variety is an elongated version of the common Green Acorn Squash and often grows to a size of 8 to 10 inches in length. Formed with the typical protruding outer ribs of the Acorn, the Fordhook is tan colored on the outside with a tradtional golden flesh on the inside. When baked, all varieties of Acorn Squash are similar tasting. They are especially delicious topped with brown sugar, honey, and butter, providing a sweet and somewhat nutty flavor. Smaller individual squash are commonly served whole and may be stuffed with ingredients such as sausage, bread, vegetables, and seasonings which have been baked once and then again inside the squash so it is served as a "stuffed squash". 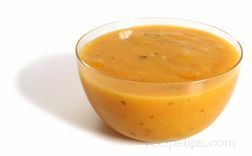 The acorn squash contains only a minor amount of beta-carotene, unlike other winter squashes, but is a good source of calcium.